With the advent of Internet of Things, every wireless network system will need a well taught combination of relevant printed sensor and printed antennas for effective machine to machine communications, at “ Reid Industrial ” we strive to make this a reality. The design and requirements of Antennas from our customers/collaborator will be effectively implemented in close co-ordination with our production team by doing further required research and development activities during the process of printing to get desired optimal results. Already for some of our clients, based on their antenna design, we have been able to effectively demonstrate different types of “ Screen Printed Mirco - Strip Antenna ” as a “ Trans-Receiver system ” to send and receive signals of varied magnitude at different ranges of frequency ranging from “ KHz to Mhz ”. The antennas are printed on flexible substrates, as per design specifications of our clients, upon proper utilization by our clients, we are be able to trans-receive data in the range of up-to 5 to 10 meters. If Antennas are designed well by our clients / collaborator, we will strive to use our antenna screen printing technologies to bring them into reality with desired quality and conformity. Some of our earlier printed antenna projects are based on UHF – RFID transponders for various application like " automotive windscreens ” , "military applications ", “ Wearable Devices with Printed Antenna as a communication channel ” and in different " Internet of Things ” (IoT) applications. Our expertise in customized printing of different types of sensors and antennas in unison with flexible substrates and further expertise of embedding micro and nano level chips onto them, will be an added advantage to provide end to end solution for wearable electronic applications. As with any form of electrically conducting structure, requires effective management of the entire screen printing process to deposit ink or paste on the substrate in a precise single step. In order to print antennas of desired ranges, quality and performance, handling of the printable inks on different types of substrates requires expertise to maintain the conformity. In the case of printing different types of antennas, the designs differ and there arises a needs to do real time manoeuvring especially in terms of " snap off distance" and " Geometry Size ". The substrates properties like surface roughness, chemical, mechanical, thermal, optical, thermo-mechanical, electrical, and magnetic properties have to be well studied, researched and documented for optimum utilization. In the case of Screen Printing Antennas, consistency in maintaining the required " planarity " of flexible or non-flexible underlying substrate will be of utmost importance. At Reid Industrial our engineers have done sufficient " R&D " and can precisely deal with varied levels of complexity. Over the period of time, based on our customers design specs through joint collaborations, we were able to precisely screen print different types of antennas over a wide range of " KHz " to ultra high frequency range of “400 to 600 MHz”. 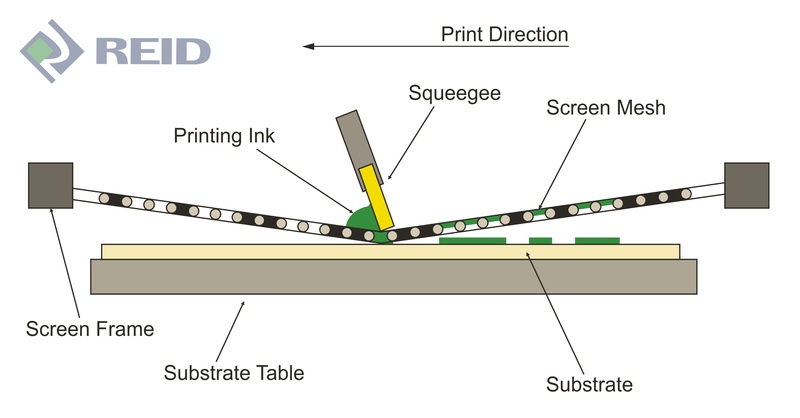 An illustration of the printing process at REID Industrial can be seen in the adjacent diagram. By utilising Advanced Manufacturing technologies and tightly controlled processes, we can maintain a high level of accuracy during the printing process. Critical aspects range from the use of high definition film positives and selecting a precise mesh and stencil utilising to achieve the desired results. Along with the substrate and ink handling capabilities, there is sufficient R&D required to repeatedly print inks of certain thickness and conductivity.